Liddell’s Division takes a position on the McDonald farm. Walthall’s Brigade is on the hill with the McDonald house. Govan’s brigade is deployed to the south. Both brigades face west. 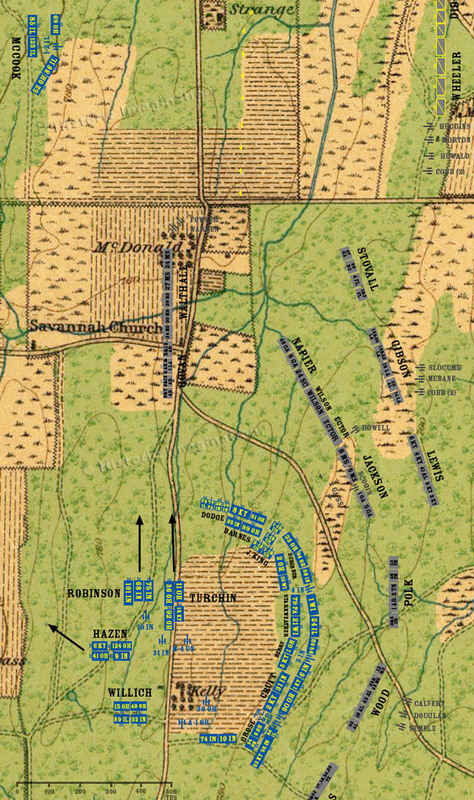 The two batteries of the division’s artillery unlimber at the McDonald house and begin an artillery duel with Battery I, 2nd Illinois posted with McCook’s brigade to the northwest. Reynold’s division moves north along the Lafayette Road.